Welcome to the first day of February Anniversary Release festivities! Everyone at Papertrey Ink has been working tirelessly behind the scenes to bring you TEN days of fun contests & challenges, prizes, inspiration and SO much more! Let's start out the day today with a few sneak peeks of what's to come for new products this month! Maile Belles has a stunning new floral set that is trendy, but illustrated in such a way that it will truly be timeless. There are options to quickly stamp a pre-assembled floral cluster, or there are even individual pieces you can use to create custom arrangements. And the font combination? To die for!!! Melissa Bickford has a new monthly series coming that is kicking off with a little something for Easter projects. The large bold word included each month with complement the companion sentiments and image so you can create lots of different looks with a $5 set! Melissa Bickford has also designed a beautiful new set dedicated to motherhood, however she has executed it perfectly so that it can be used for other types of recipients too! You will not want to miss the amazing possibilities this set holds! Now that we have the sneak peeks taken care of, let me introduce you to the 2013 Papertrey Ink Design Team. I have asked each of them to share six of their favorite Papertrey projects with you, in honor of our sixth anniversary! While there are no "new" introductions, I feel as though it is still important to take this opportunity to give each of them a shout out and commend them for their contributions to creativity, not only on behalf of Papertrey, but to the entire paper crafting industry and community. 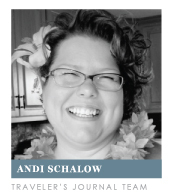 Ashley says, "Periodically, the team checks in on one another to see how we are holding up with creating our projects and deadlines. Each month, I try to get ahead of the game, perhaps to be the person who lets the entire team know..."I'm all done" or "just 1 more project to go." But, every month I'm creating right into the wee hours of the night and just meeting those deadlines. I think it's so funny that I've tried each month since being on the team since November 2011, but have yet to achieve the goal of completing all of my assignments with plenty of time to spare. I'm really hoping this year, I will be able to be the person who finishes extra early. A girl can dream, right?! Here's to the crafters who also burn the midnight oil!" Ashley is such a unique paper crafter, in that she takes the most unpredictable combinations of products, colors and embellishments, and turns them into a masterpiece! I love that every time I visit her blog, her projects lead me to jot down ideas to try out in my own crafting space. You know someone has true talent when they inspire you to go try something new yourself! Not only is Ashley an amazingly gifted artist, but she also has a heart of gold. 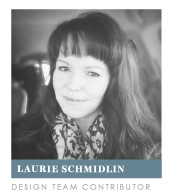 She is a wonderful asset to the team as a wonderful contributor AND friend. I couldn't ask for a better representative of our company and I am so pleased that Ashley is continuing on with us for another year. 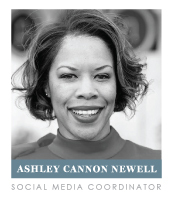 CLICK HERE to see more about the favorites from Ashley Cannon Newell. Betsy says, "Where has the year gone? I can't believe it's time for another Papertrey anniversary celebration...but what's really hard to believe is that I've been working with Papertrey since October 2008. That means this February will be my 54th release! When looking through past projects to choose my favorites for this post, it's funny how looking through them reminded me of what was going on in my life when I created them. My April release projects remind me of the day I set up a table in my living room to stamp because I was having a garage sale. My August projects make me think of the days we were re-siding our home and I would sneak in a few minutes of stamping in between painting! It was fun to look back and through the year and be reminded of those things, but I'm also excited to look ahead to all of the inspiring things Papertrey will be bringing us in the next year! I hope you're ready for a fun ride!" "Betsy did again!" can often be heard out loud in my office as I prepare graphics for group posts each month. I have never seen a single artist repeatedly "hit it out of the park" like Betsy does. She puts so much thought, so much time & love, so much creativity into every single creation. She is the queen of taking an ordinary product and making it extraordinary. I love Betsy's upbeat personality and the ray of sunshine she brings to everyone through her blog posts and her interactions within the forum. She is a true gem and someone I am very proud to have on our team. 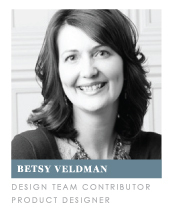 CLICK HERE to see more about the favorites from Betsy Veldman. Cristina says, "I’m the rookie on the team, and I still remember vividly the day that an email from Nichole landed in my inbox, inviting me aboard. It was June 2012, and I was due with my second child the next month. 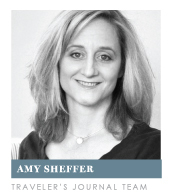 The chance to be on the Papertrey team had been a dream of mine, so I didn’t want to turn it down, but ack! Could I handle it with a newborn in the house? I agonized over it for about 24 hours, then I finally emailed Nichole to explain my dilemma. She couldn’t have been more understanding and accommodating, and the rest of the team welcomed me with open arms. After my son was born, after the mass email to friends and family was sent, one of the first things I did was share the news with my PTI peeps. For years, I was such fans of all of them. Now I feel like they’ve become my friends. " While Cristina has not been with us for long, she has made an everlasting footprint on the team and we can't imagine it without her! Her spectacular clean & simple designs are something that I personally enjoy seeing on a regular basis. She really inspires everyone to take just a simple image or two and create a true work of art that is quick and easy to create. Cristina proves that a project doesn't need much to be a masterpiece in of itself, and I love her for reminding us all of this. Her sweet disposition and her professionalism make her an all-star in my book and I greatly look forward to getting to know her even better during the next few months. CLICK HERE to see more favorites from Cristina Kowalczyk. 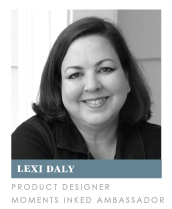 Danielle says, "I have been with Papertrey Ink for exactly 2 years now, since February 2011. Being on this team has really helped me grow as a designer and pushed me in creative ways I never thought possible! Each month, I am still so excited to see what's new. To me, Papertrey Ink really has driven the trends in the paper crafting industry - the trendy, elegant stamp designs are one of a kind. I have truly loved getting to know the girls on the team, between the phone calls with Dawn and emails with Melissa and Jessica and the other team members! Jessica and I are always reminding each other of the deadlines and helping each other out. The camaraderie of the team is amazing, and I can tell you that each one of the Papertrey Ink ladies is truly genuine. Well, it was extremely difficult to pick only six of my favorite projects from the past 2 years, and since I've already posted many of the mini albums and the larger projects as my favorites in the past, I decided to pick six of my favorite cards for this post. I hope they will inspire you to break out your stamps and dies and get creative!" Danielle has an eclectic, shabby-chic style that is the envy of so many of us! Her color combinations, homemade embellishments, layers and just overall creative use of product is so incredibly inspiring! She truly has a knack for looking at things differently and making us believe in her vision at the same time, and I admire her greatly for that. Danielle's amazing personality and kindness are also important characteristics to note. Her presence within the team forum is like a rainbow on a cloudy day, full of color and energy. Her enthusiasm is definitely contagious and I am beyond thrilled to have her on board with us for another year! CLICK HERE to see more favorites from Danielle Flanders. Dawn says, "I have been with Papertrey now, since July of 2008! Goodness how the time flies....I can’t believe my five year anniversary is just around the corner! I can honestly say it’s been such a joy and I’m so grateful to be a part of this amazing team. There are certainly times behind the scenes when things don’t arrive when they should or something doesn’t go just exactly according to plan, but it’s so great to be able to share those moments with such a dear group of friends on the Design Team. These girls make me laugh, they inspire me and make me extremely grateful for this job. 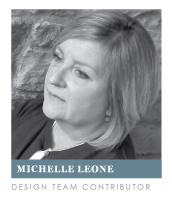 And I can’t fail to mention how graciously Nichole leads the team. I recently had a box full of goodies for an upcoming release that was MIA and showed up really late. Rather than be super stressed about it and in turn, pile that stress on me, Nichole just rolled with it as she’s so great to do. I appreciate that so much about her and I’m so grateful to her, Jane & Julie for all of the opportunities that they’ve afforded me in my position with Papertrey Ink." When you think of Dawn, you think bright colors and vibrant creations. Her design style is all about color and the things that make her the most happy. I love that when a project, I can instantly tell whether or not it is Dawn's creation because it just exudes happiness! Not only are her paper crafting projects happy, but she herself is a positive person who is constantly smiling! She is always sharing words of encouragement for those that need it within the team and she is always one of the first to cheer when someone has good news to share. Dawn's talents, both as an artist and a friend, are a wonderful contribution to the team and we are so lucky to have her on board with us for another year! 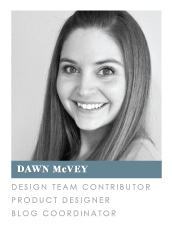 CLICK HERE to see more favorites from Dawn McVey. 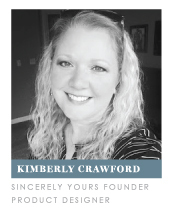 Debbie says, "I'm always delighted every month to see what Nichole and other Papertrey Ink designers have come up, and I've had this privilege right from the beginning five years ago! When my Papertrey box arrives, it's pretty much like Christmas every month. Other than actually getting my box every month, my close-second-favorite time is always seeing what the other girls have come up with. The range of styles on the Papertrey team is incredible, from Maile's and Cristina's clean, strong simplicity, to Melissa's and Danielle's sweet, perfect shabbiness; from Betsy's and Jess's great color combos and rock-solid design to Ashley's and Erin's modern and totally on-trend use of materials; from Dawn's ability to make any style her own to Heather's magic with kraft and rusticity. Last, but never least, Nichole. . . I can honestly say that every month I look at her countdown pieces and think, "WOW! Why didn't I think of that?" I am inspired by each of them--truly--and I'm happy to continue be a small part of this team." 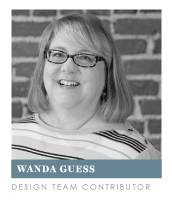 Debbie has been with us since the beginning and after working with someone for this long, you tend to run out of superlatives that can aptly describe them. Even though Debbie works with us as a "special agent" and contributes only a handful of projects to the release each month, her work continues to inspire all of us to brand new levels. Her skill with Copics always pushed me to try new things and continue to practice getting them to work the magic she seems to execute so effortlessly! Her warmth and kindness on a personal level is definitely something that is worth mentioning as well. She is always a wonderful person to work with on so many different levels, and I appreciate her and the time she dedicates to Papertrey each and every month! CLICK HERE to see more favorites from Debbie Olson. Erin says, "For the second time during my PTI tenure (starting in February of 2010), I was pregnant this past year. In searching for a baby name, I ran across the name of Dawn's sister on her blog--Glory. I was also, at the time, lobbying hard to schedule a c-section on July 4th. (It just happens to be the best birthday one can have. I speak from personal experience, seeing as I'm a 4th of July baby too. You never have to work or go to school, there's always a party, you get fireworks. Seriously, it rocks.) I thought Gloria "Glory" Josephine would be a great name for a little girl born on July 4th. I'd have never thought of it if it wasn't for Dawn. Of course, I immediately told the team my thoughts. Gushing and baby talk soon followed. You know how us moms-to-be are...nothing is a hotter topic than baby this and baby that. The girls indulged me. And Dawn was super excited that there was going to be another Glory around. We all know how this goes, right? I had a baby boy on June 22! So much for our grand PTI baby plans. But this is an excellent example of how open, loving, and chatty the group of these talented ladies are. We work hard and we play hard. I'm so very honored to counted in their ranks." Even with lots of little kiddos running her in circles at home, Erin impresses me with her ability to truly "do it all". Her designs are always like a breath of fresh air, using amazing combinations of products, both new and old, to amaze us and inspire us. Erin is a super fun person behind the scenes and often times provides team members with a good "chuckle" of the day, often times with cute stories about her little ones. Erin is an incredible person with many talents and I am truly looking forward to working with her for another year. 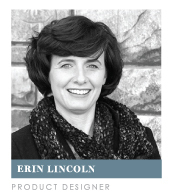 CLICK HERE to see more favorites from Erin Lincoln. Heather says, "I have been with Papertrey Ink since the very beginning and I can't tell you enough how much it has been a blessing in my life. 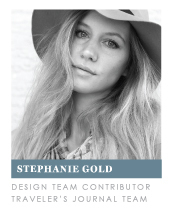 I couldn't have better people to work with at Papertrey and all of the design team girls are fabulous. Sometimes, working from home can be a little lonely and I think the design team girls keep everyone lifted up with supporting each other with projects, deadlines (ding dong! ), and events going on in our everyday life from the little things to ones most epic. This past year I also especially loved getting to know some of the Minnesota Paperytrey Ink customers at stamping get togethers down near Minneapolis. There is nothing better than some good quality stamping and creating time with people who are just as obsessed over all of this as I am. The past 6 years have truly been a wonderful adventure and I look forward to many more in the future! Happy 6th Anniversary Papertrey Ink!" 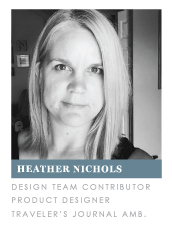 Heather is another designer who has been with us since the beginning, nearly six years ago! Heather certainly has her trademarks, such as Kraft cardstock and white ink, but one of the things I love best about her is the passion she invests into her scrapbooking projects. She pours her heart into each layout, every mini book, making it something that will be a memorable keepsake for years to come. What a special gift for not only her family, but for us to enjoy and gain inspiration from as well! Heather is so laid back, it makes it easy to work with her, and I know the coming year will be just as amazing as the last six! CLICK HERE to see more favorites from Heather Nichols. 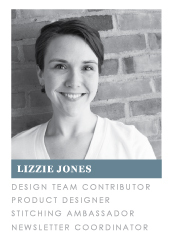 Jessica says, "So very thankful that I get to be a part of the Papertrey Ink team once again! December marked my 3rd anniversary with PTI... this will be my 39th release... wow. This year has been a fun one with the team as we've laughed together and encouraged each other. I especially love my monthly chats with Danielle as we keep each other updated on our projects and spur each other on. Papertrey products still have such an ability to inspire me and lots of that comes from Nichole and the rest of the team. I so LOVE being encouraged to try something new, give it a shot, do whatever feels like me... that's PTI to me :) "
Jessica is another of our clean & simple gals, but what I love about her is the little dose of eclectic style she injects into her projects. Whether it be an interesting color scheme, or a unique embellishment, she always has just a touch of something that is so "Jessica"! Her personality is the much of the same, with little "Jessica" zingers thrown into a conversation, things will never be boring! With all of that aside, Jessica is a charitable, warm-hearted gal who always puts others ahead of herself. She inspires me both in creativity and moral compass and I count it as a huge blessing to get to work with her again during the coming year. CLICK HERE to see more favorites from Jessica Witty. Maile says, "I'm so exited to be sharing in another Papertrey Ink anniversary celebration! PTI is celebrating 6 years of amazingness and I couldn't be more honored to have been apart of that since 2010. This last year has been a great one! There's nothing like getting to know and growing closer with a team of talented designers that all have a common love of stamps. A recent highlight that comes to mind is the kindheartedness of this team through our Christmas exchange. This was a first for us as a team. A gifting from one team member to another, of a box of thoughtful and well loved crafty goodies. My gift from Betsy was one of my favorites from the Christmas season. She packaged each piece gorgeously in her "Betsy" style. The presentation was the best part! I look forward to sharing another year with them as part of the team." Maile may be soft spoken and somewhat shy, but her projects are always both brilliant & bold. When you look up "think outside the box" in the dictionary, there you will find Maile and her amazing artwork. She is well-known for turning images at interesting angles, creating amazing arrangements from just a few stamps and ink. I admire Maile for her fierce love of her family and her son. She is an amazing example of someone who has conquered balance in her work and at home and I strive to learn from her as we work alongside each other for another year. CLICK HERE to see more favorites from Maile Belles. 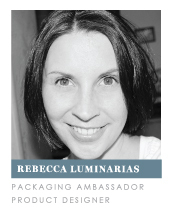 Melissa says, "I have been with Papertrey Ink for about 5 1/2 years. I can't believe it's been that long! You see, each month as the new stamp sets and products arrive, I feel like I've been given the opportunity to design for Papertrey Ink all over again. I can't begin to tell you how much joy and inspiration I have experienced while working here. I love it that the magic of creating has not faded and seems to begin again with each new release. This year I have had plenty of good laughs at myself while taking the plunge into making videos and tutorials. Holy cow! I've even been in tears a time or two. I am one who loves blending into the background. I am so happy and comfortable there. But, growth and change are always good and I took on the challenge of tutorials to push myself out of my comfort zone. If only we could have an "MIM Bloopers", I'd have plenty of material to provide. My favorite moments are those though when after I have finished my recording, that I find my little girl sitting in my chair at my craft table, the video camera positioned to record the making of her latest and greatest creation, hearing her repeat phrases and explain her process. It warms my heart, makes me laugh, and creates an awesome memory." Melissa has a wonderful soul, from the top of her head to the tips of her toes, her warmth exudes into every aspect of what she does. Her words, her projects, her actions. They are all full of sunshine and sprinkles of glitter, making the world a more beautiful place. She is an amazing person with so much talent, I am often left speechless after seeing her designs, dissecting every precious detail. Melissa has a strong positive presence within the team and it just wouldn't be the same without her. I am so incredibly happy that she is joining us for another year so we can all learn more from her together. 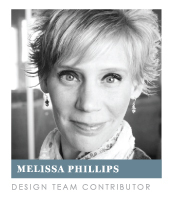 CLICK HERE to see more favorites from Melissa Phillips. Now that the Design Team has shared some of their favorite projects with you and I have gotten the opportunity to sing their praises, it's your turn! 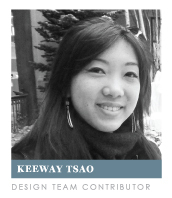 Today's post is all about the design team and their talents, along with their favorite Papertrey projects from the past. Your challenge today is to create a project of your very own inspired by one of their fabulous creations! 1. Create a new project that is inspired by one of the Design Team Favorites projects shown above. 7. You have until 7am EST, Friday, February 15th to add your project link or comment and qualify for the contest. 8. The lucky winner will be announced on our February Release Winner page no later than noon EST, February 15th. One lucky winner will receive their Papertrey wish list for FREE (up to a $300 value)! Be sure to create a special wish list within your account on our website labeled "Anniversary". If you are randomly selected as a winner, you will be sent the first $300 worth of items on that list!!! Best of luck with the contest! EDITED TO ADD: Several customers emailed us for clarification on this particular contest, and we though it best to also update this post. We encourage customers to include more than $300 worth of items on their anniversary wish list because if a particular item is out of stock on the morning of February 15th when the winner is selected, we will replace it with the next item on the list.